The physicians of Arthritis and Rheumatism Associates, P.C. have been using musculoskeletal ultrasound (MSK US) since 2007 and are nationally recognized as experts in this field. We have been teaching other rheumatologists to use MSK US through our participation in the American College of Rheumatology’s Introduction to Musculoskeletal Ultrasound course. MSK US functions like a microscope for living tissue, allowing us to see muscle, tendon, joint and soft tissue pathology in real time while patients are visiting our offices. It has a well- defined role in allowing us to see active tissue inflammation through the use of Color Power Doppler (CPD). Early rheumatoid arthritis can be visualized to define this disease even before the changes are seen in the serum tests we routinely employ. Here is a case of a young woman, rheumatoid factor negative, who was treated surgically for wrist pain without relief. MRI without contrast showed ligamentous injury. 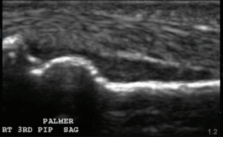 During a subsequent rheumatologic consultation, ultrasound was employed and showed CPD signal (red linear change) inside the wrist synovium (black and gray zones) above the carpus (white linear change). In addition, a view in the palm of the 3rd digit revealed increased effusion (black zone) at the proximal interphalangeal joint consistent with synovitis. These ultrasound changes resolved along with her pain after etanercept (Enbrel) was started. We routinely employ MSK US during arthrocentesis, as several studies support the ability for sonographic guidance to statistically reduce procedural pain, reduce joint pain in response to injection, increase the percent of patients who respond to injection, decrease the number of non-responders and significantly reduce the amount of pain at the end of the procedure.